Market risks come in three flavors: recession risk, economic shock risk, and risks within the market itself. So, what do these risks look like for September? Let’s take a closer look at the numbers. Recessions are strongly associated with market drawdowns. Indeed, 8 of 10 bear markets have occurred during recessions. 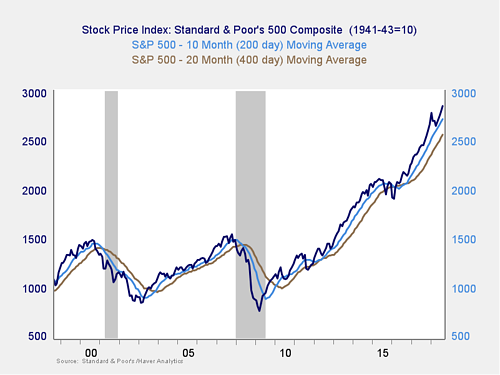 As I discussed in this month’s Economic Risk Factor Update, right now the conditions that historically have signaled a potential recession are not in place. 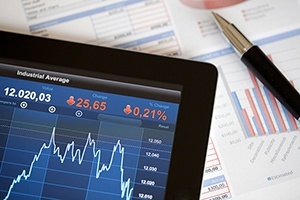 Yes, some of the data is softening, and trends may be changing. But on an absolute basis, conditions remain good—with healthy job growth, high levels of consumer confidence, and expansionary business confidence. As such, economic factors remain at a green light. 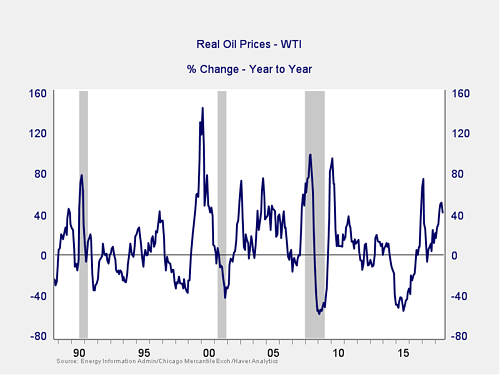 A quick price spike like we saw in 2017 (it did not appear to reach a problem level and was short lived) is not necessarily an indicator of trouble. The subsequent decline also took this indicator well out of the trouble zone. Recently, prices have risen again and have started to approach a level of concern. Last month, however, the price increase turned down. Just as in 2017, while the risks from this measure are rising, they are not yet material or immediate. Therefore, the indicator remains at a green light, although we are getting closer to a high risk level. 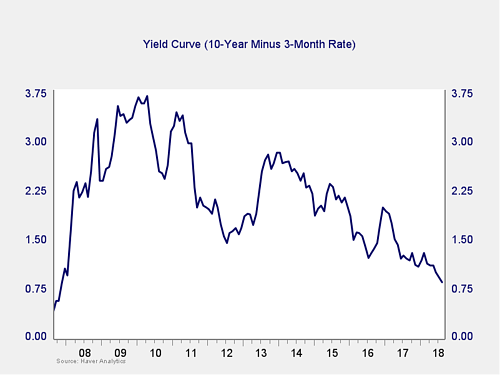 The yield curve spread dropped a bit further in August, taking it to a new postcrisis low. It is still well outside the trouble zone, so the immediate risk remains low. But the fact that the spread is at a new low, in combination with the Fed’s expected rate increases, suggests that this remains something to watch. I am leaving this measure at a green light for now, but you can see a shade of yellow. Here, you can see that when valuations roll over, with the change dropping below zero over a 10-month or 200-day period, the market itself typically drops shortly thereafter. 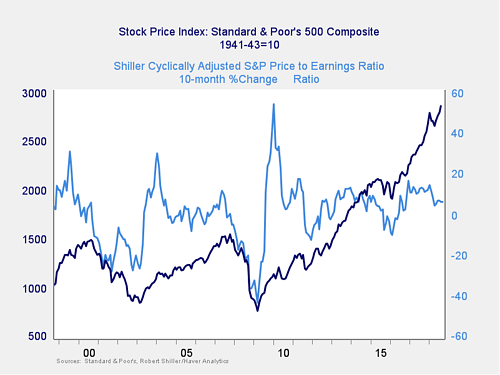 In recent months, valuations have dropped toward the risk zone, but they may have stabilized in the past couple of months. 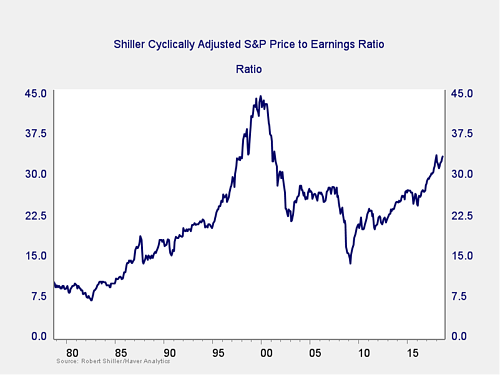 While the long-term trend in valuations remains at a positive level, risks are rising. Therefore, this indicator stays at a yellow light. 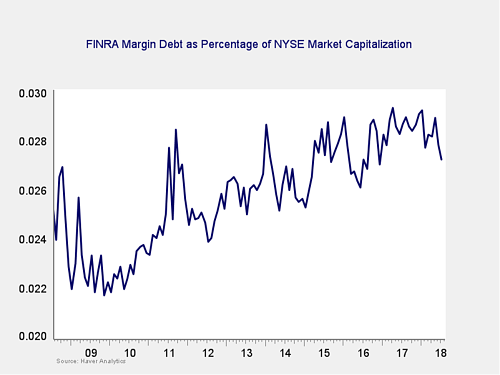 Debt levels as a percentage of market capitalization ticked further down last month, but they remain close to all-time highs. The overall high levels of debt are concerning; however, as noted above, high risk is not immediate risk. 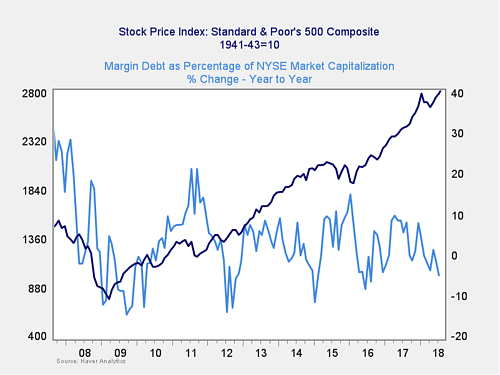 As you can see in the chart above, the annual change in debt as a percentage of market capitalization has ticked down again, moving below zero over the past couple of months. This indicator is not signaling immediate risk and, in fact, is showing decreasing risk. Still, the overall debt level remains very high. As such, the risk level is worth watching, even though there has been some improvement. We are keeping this indicator at a yellow light. These indicators remain positive, with all three major U.S. indices above both trend lines. The Dow did briefly drop through its 200-day in June. In the past couple of months, we have also seen the S&P 500 bounce off its 200-day on a daily basis several times, which could be a sign of weakness. But looking at monthly signals, as this chart does, there has not been a sustained break. With no convincing movement either way, the risk of the trend turning negative has risen materially. The most probable case is that the markets continue to rise, as they failed to break support even at the nadir, and this case has been supported by the recent move back to all-time highs. But given the fact that both the Dow and the S&P recently hit their support levels—and that the rebound has been modest—risks of more volatility have increased. So, I am keeping this indicator at yellow. After taking the market risk indicator to a yellow light for the first time five months ago, markets have since recovered. This recovery was more or less expected. At the same time, the yellow light rating recognized that risks have risen. Despite the recovery, and the fact that we are once again close to all-time highs, those risks are still there. The overall economic environment remains supportive, and neither of the likely shock factors is necessarily indicating immediate risk. But the continued volatility and the fact that several of the market indicators point to an elevated level of risk—combined with the ongoing policy concerns—suggest that volatility may get worse. 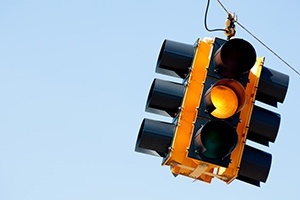 As such, we are keeping the overall market indicator at a yellow light. This is not a sign of immediate trouble. 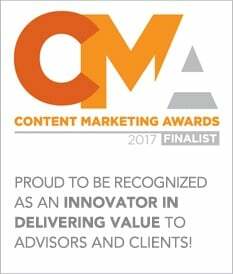 Indeed, the likelihood remains that the market will keep moving higher. Rather, it is a recognition that the risk level has increased materially and that, even as the market recovers, further volatility is quite likely.